From left : Luda Zueva, Regional Marketing Manager for Personal Health, Philips ASEAN Pacific, Matt Moran, General Manager for Personal Health Philips ASEAN Pacific and Muhammad Ali Jaleel, Country Manager of Philips Malaysia. Hey! How well do you take care of oral hygiene? Don't forget, your teeth need as much attention as the rest of you. Having clean teeth and fresh breath is important for that healthy smile. Improper oral health care routines could cause a deeper problem than just on the surface of your teeth, sinking deep into the gums and affecting your entire mouth, thus posing a potential risk for gingivitis and periodontal diseases. These diseases can cause excruciating pain, loss of teeth, infections and affect people’s daily lives and overall health. 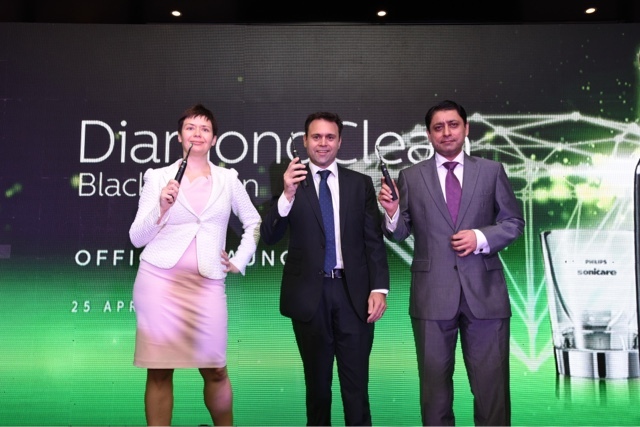 With that being said, Philips Malaysia has launched its new Philips Sonicare DiamondClean electric toothbrush to help Malaysians ensure good oral healthcare the smarter way. The Philips Sonicare DiamondClean offers five modes for superior cleaning – clean, white, gum care, sensitive and polish. The clean mode ensures ultimate plaque removal while the white mode helps whiten the surface of teeth to remove stains. The gum care mode combines the clean mode with an additional gentle massage for the gums to improve gum health. Those with sensitive teeth, fret not, the sensitive mode is extra gentle to cater to your needs too. Last but not least, the polish mode brightens and whitens the teeth, giving a nice finish to the total brushing routine. Not to mention, the unique diamond-shaped bristles on DiamondClean toothbrush heads is Philips Sonicare's best whitening brush head. The wider surface area and denser bristle pack will effectively yet gently sweeps away plaque and extrinsic stains, providing an exceptional clean and significantly whiter teeth. The Philips SonicareDiamondClean also comes in a compact size for those on the go or traveler. With the Philips Sonicare DiamondClean, our oral hygiene care get easier and more convenient in the comfort of our home. Users can also expect a total and ultimate cleaning with plaque removal, gum care and whitening of teeth. 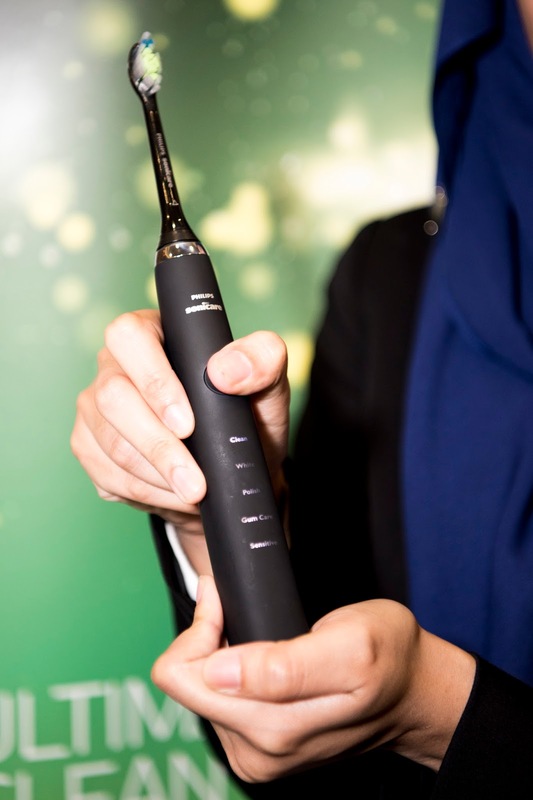 The Philips Sonicare range available in Malaysia since 2011, comprises various toothbrushes, all of which employ Philips’ patented sonic technology for dynamic cleaning action to deliver clinically proven oral care results. With 31,000 brush strokes per minute, it is proven more effective than normal toothbrushes for cleaning of teeth and removal of plaque. The Philips Sonicare range, which features unique bristle tip velocity, includes the #1 sonic power toothbrush most recommended by dental professionals worldwide for the past 20 years. The Philips SonicareDiamondClean retails for RM999 in black is available at the Philips Brand Store in Publika Shopping Gallery and The Gardens Mid Valley, both in Kuala Lumpur, and in Sutera Mall, Johor Bahru; at Philips Experience Stores in Menara Axis, Petaling Jaya and in Penang and at retail partners and distributor stores nationwide and online via Blip.my. The Philips Sonicare DiamondClean in purple is available only at dental clinics. b) Available in two colours – black and purple. Black is available in stores and online, and purple is available through dental clinics.